Latest News - Integral University has declared merit list for admission to the various undergraduate courses on official website www.integraluniversity.ac.in. Candidates can download their Merit List from the direct link given below. The entrance test (2nd Phase) for BTech, BArch, BPharm, PharmD, Diploma (Engg), MBA, B.Sc. (Agriculture/Horticulture/Forestry), M.A.B.M., M.Tech., M.Pharm., M.Sc., MCA, MCA-Lateral Entry courses is scheduled on 16th June, 2015. IUET Entrance Exam 2015 had successfully conducted on 09th May 2015 from 10:00 AM to 12:00 AM at various centers in all over the state for getting admission in various UG and PG Courses i.e. B.Tech. (Agriculture Engineering), B.Sc.(Hons.) Agriculture, B.Sc.(Hons.) Horticulture, B.Sc.(Hons.) Forestry, B.Sc.Hons. (Biotechnology), B.Sc.Hons. (Industrial Chemistry), B.Sc.(Hons.) Home Science, B.Arch. (Architecture), Diploma in Engineering, Certificate of Proficiency in Arabic/French German and Diploma in Arabic/French and German in various colleges based on the merit list which will be released on official website. 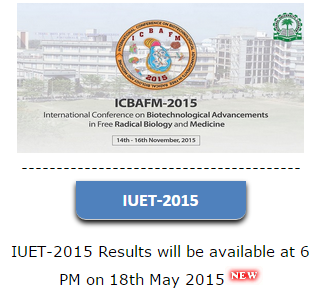 The latest news is that IUET Result 2015 / IUET Scorecard 2015 has declared on 18th May 2015 at 06:00 PM on official website. The list of successful candidates for admission through counselling to B.Tech. / B. Pharm. courses will be displayed on the Notice Board / Website of the University on 18th May 2015. 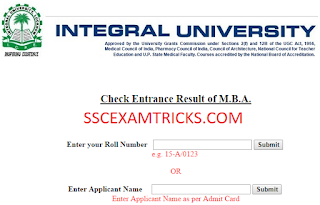 Earlier Integral University had invited online application for IUET Entrance Exam 2015 for getting admission in various courses of UG and PG courses in the state. A huge numbers of candidates had applied for this examination. A huge number of candidates had appeared in this examination and waiting for their IUET Result 2015. Those candidates who had appeared in written examination and waiting for their result, they can download their online result / scorecards / marks details from the direct link provided below. · Save and print the result Hard Copy for appearing in Counseling Process. Latest News - IUET 2nd Phase Admit Card 2015 has released on 03rd June 2015 on official website http://iuet.integraluniversity.ac.in/ for those candidates who had qualified in 1st Phase of Written Examination. Candidates can download their IUET 2nd Phase Admit Card 2015 in two ways. 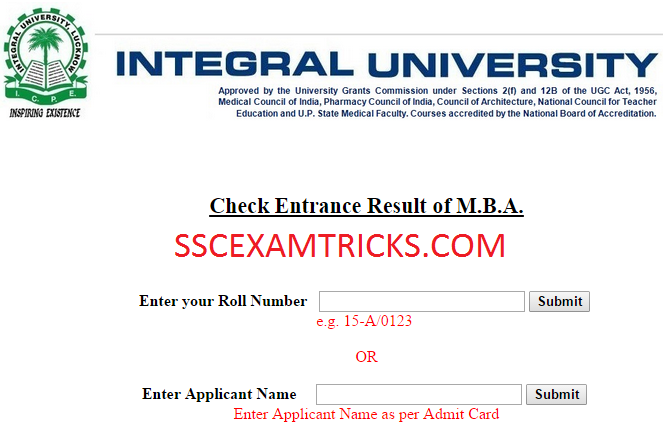 First way to download IUET 2nd Phase Admit Card 2015 by entering FORM NUMBER in the blank box provided on the screen. The second way to IUET 2nd Phase Admit Card 2015 by providing Application Name and Mobile number of the candidates. In both ways, candidates will be pressed Submit button which will be provided in the end of the page. Those candidates who are waiting for IUET 2nd Phase Admit Card 2015, they can download thier IUET 2nd Phase Admit Card 2015 from direct link provided below. Date of Entrance Test (2nd Phase): Tuesday, 16th June 2015.